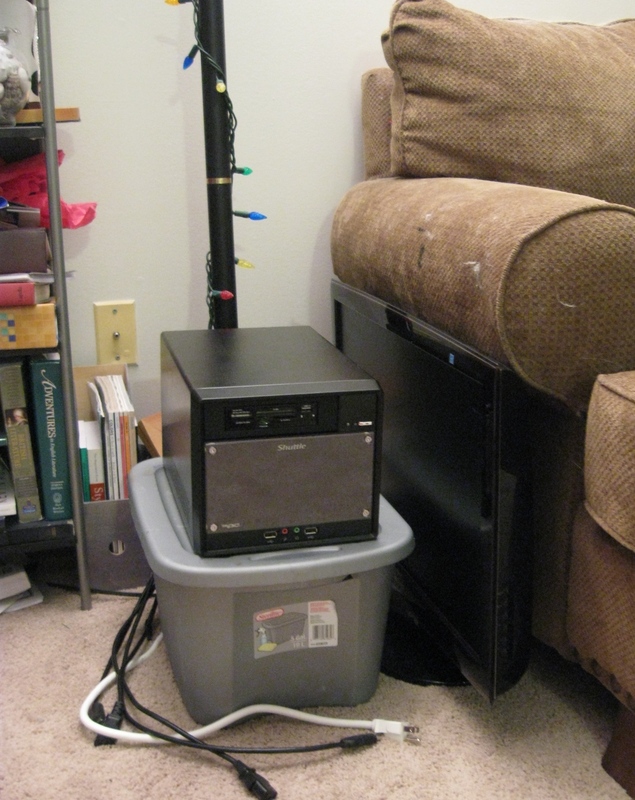 The term “cable management” describes the art of organizing your computer or home theater wiring in a way that it doesn’t look like a dish of electronic spaghetti. If you’ve read five gallon computer desk you’ll know that I’ve been using a bucket to stand my tablet computer up and store it out-of-the way when needed. I’ve recently upgraded to a powerful but tiny five gallon desktop computer. It actually fits inside a 5 gallon bucket, although not comfortably. I wanted this desktop to be as mobile as possible, so I’ve cobbled together a bucket-based invention to control cables and make the whole system very portable. In essence, I’ve got one cable running into the bucket connected to a multi-outlet power bar. 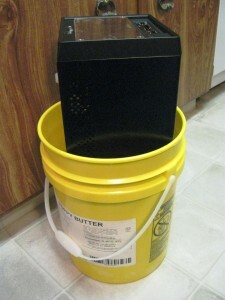 I only put 2 holes in my computer bucket – one small one on the bottom for the power input and a larger one hidden in the handle for the 5 outputs. The key to making this work really well is that all cables must run through the bucket. It’s the only thing that’s allowed to have a tail. Here’s a shot of the inside which shows all the mess I’ve hidden inside the 5 gallon bucket. I’ve got lots of extra goodies in there – a watt meter, a DVD drive, and a box to store paperwork. And there’s still lots of room left over. I’ve taken care to not keep anything that produces heat in here. 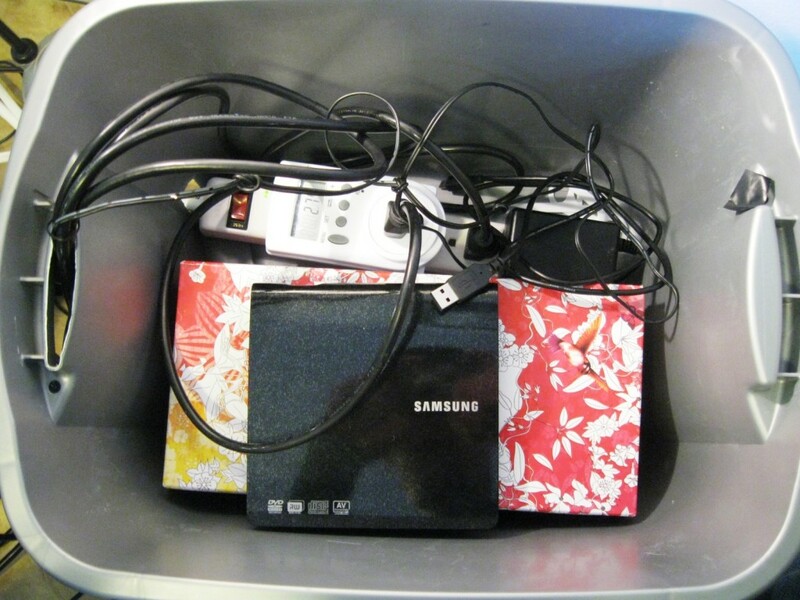 A fire hazard is one thing we don’t want to create from a 5 gallon bucket. 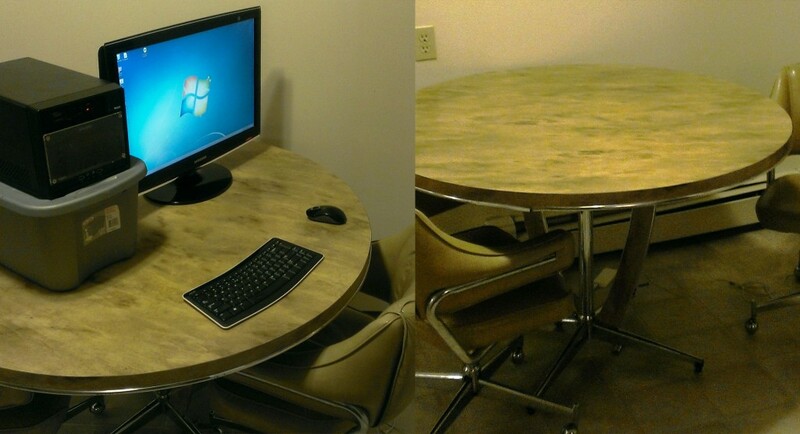 The whole setup is designed to be broken down at a moment’s notice so we can use the table for other purposes. I estimate we save at least 200$ each month by not needing an extra room in our house for an office. 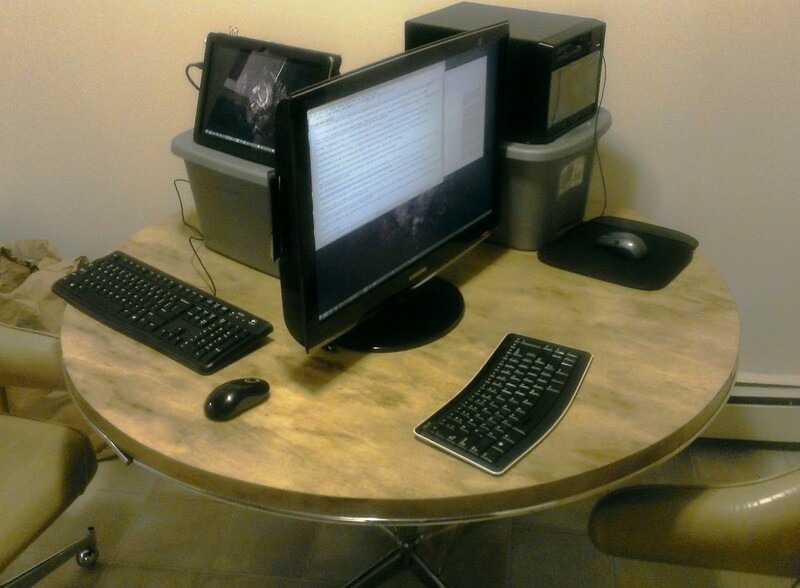 To cut down further on cords I’m using wireless technology for internet, mouse and keyboard. These accessories store neatly in the bucket when not needed. To the right is the complete office tucked away beside the couch. You can click to see the larger version. It takes less than a minute to break down and stow away and the same amount of time to set it back up again. Bonus: As my strange tiny company grows, I need more people in front of more screens to get all the work done. This is what a tiny five gallon cubicle farm looks like. 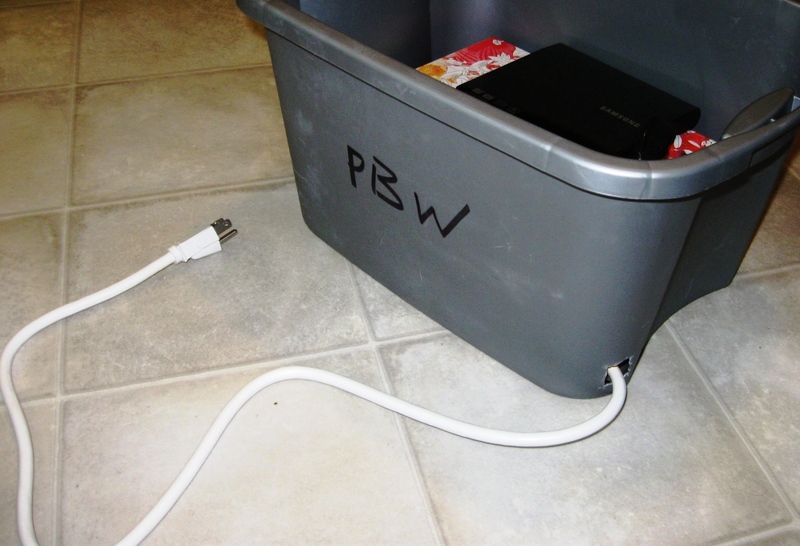 Update: This bucket based cable management idea is inciting a bit of controversy. The two main criticisms are around its A. ugliness and B. heat buildup. Is it ugly? Probably! I think it looks cool but I have very little taste. Perhaps if I was willing to spend a bit more money on this system I could make something prettier. The overheating arguments are usually based on the heat created by power supplies. 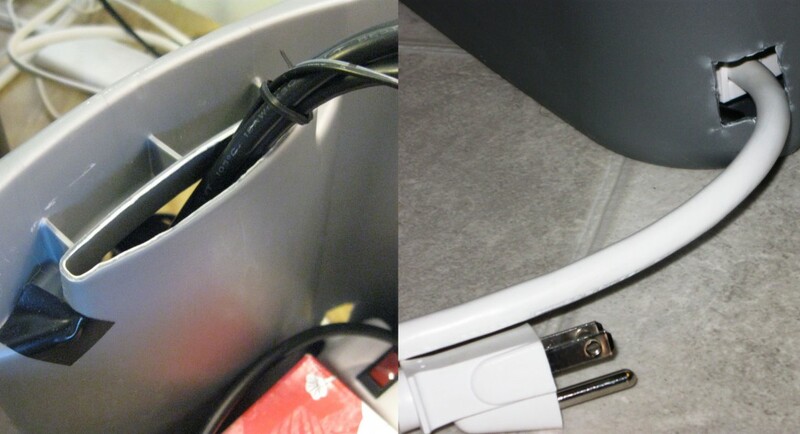 I actually don’t keep any power supplies running in my cable bucket because they DO create quite a bit of heat. Heat is released as waste from the conversion of AC to DC power. The higher the power needs of a device, the more waste heat will be released by the conversion process. In most PCs and monitors, this power conversion takes place in the device itself. 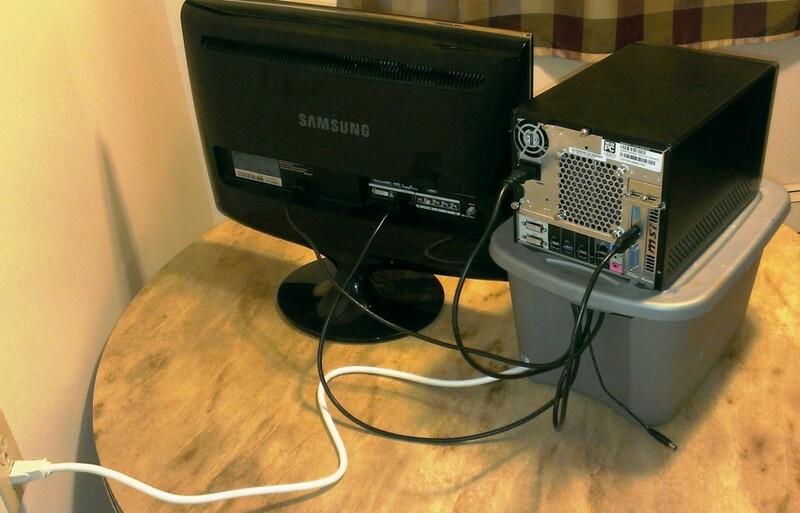 Laptops and some monitors are the exceptions, and more care should be taken to prevent overheating. Some readers claim that power bars create heat, which I don’t think is usually true. A power bar doesn’t actually convert power, it just increases the number of outlets. Heat is released in the conversion between AC and DC power. Because macs don’t have any cables…? ?